Tiny jet engines; axions; fluorescence inspection. The Max Planck Institute for Intelligent Systems has developed the world´s smallest jet engine. Samuel Sánchez, a researcher from the Stuttgart, Germany-based R&D organization, officially received the Guinness World Record certification for the smallest nanotube travelling through fluid. The technology makes use of propulsion, which resembles the characteristics of a jet engine. Researchers developed a nanotube that is 220nm in diameter. The structure is propelled in a liquid called urea. The urea reacts with the enzymes inside the nanotube. The catalytic reaction propels the structure much like a jet engine. “One day, our nanotube will travel through a person´s body and apply drugs where they are most needed. It will carry cargo. Or act as a needle with its sharp front as it can penetrate a cancer cell and destroy it,” said Sánchez, who is also a ICREA Professor at the Institute for Bioengineering of Catalonia (IBEC) in Spain. The search for dark matter continues to heat up. Recently, the XENON Collaboration, a group of researchers from several countries, has released the first results from a dark matter experiment. The group has developed a giant liquid xenon detector in an underground lab in central Italy. Then, a U.S.-based effort called the LUX-ZEPLIN Group recently took another step towards finding dark matter. The group built the so-called Large Underground Xenon (LUX) dark matter detector in Lead, South Dakota. Now, a group from Europe has formed the MADMAX Collaboration, a new experiment that will investigate the nature of dark matter. In theory, 4.9% of the universe consists of observable matter, such as protons, neutrons and electrons. Then, some 68.3% of the universe is dark energy, while the remaining 26.8% is dark matter. Dark matter exists in the universe, but it is invisible to the entire electromagnetic spectrum. There are several efforts to detect dark matter, which is composed of so-called weakly interacting massive particles (WIMPs). To date, though, researchers have failed to directly observe or detect dark mater or WIMPs. The MADMAX Collaboration (MAgnetized Disc and Mirror Axion eXperiment) is taking a different approach. Researchers will attempt to look for particles called axions, which, in turn, could explain dark matter. The axion is a hypothetical elementary particle. So far, though, researchers have been unable to detect axions. The problem is that researchers have been unable to build a system sensitive enough to detect them. 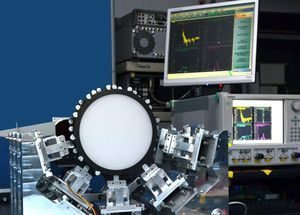 The goal is to develop a detector called “dielectric haloscope.” The principle has already been tested. While lacking a magnet, these setups had up to five sapphire disks (20 centimeters in diameter), according to the group. 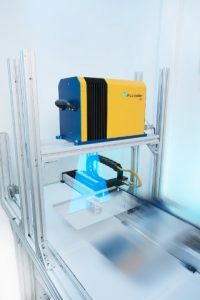 The Fraunhofer Institute for Physical Measurement Techniques IPM has developed a new fluorescence scanner inspection technology for use in macro defect detection. The technology enables researchers to inspect metallic parts for residues of grease, machining chips and cleaning agents. It solves several problems. Tiny particles can land on the surface of components during the production flow. Take an oil pan in an engine, for example. If impurities stick to the sealants, then oil will likely leak from the engine. It is not feasible to inspect every component for contaminants. One solution is to test random samples, which is a time-consuming and an inexact method. Enter Fraunhofer’s fluorescence scanner technology. In one possible application, a component travels on a conveyor belt. Then, a point-source UV laser scans the component. The laser beam scans the object at 200 times per second. Then, it creates a point-by-point grid. If there are contaminants, the source reflects light in the visible fluorescence spectrum. The detector captures the light frequencies. It then interprets the signals as signs of contamination.